$290.00 M 1935 Infantry officer visor hat with distinctive WW2 style square visor, in olive green wool with crimson piping and band, circa late 1940s- early 50s. Marked size 58, but the actual size is closer to 57 (approx. US size 7 1/8). Very uncommon example in relatively large size and premium condition. $270.00 M 1955 Infantry officer dress visor hat, dated 1956. An attractive and distinctive hat from the "Zhukov period", in very good to excellent condition. Size. 57. $95.00 Infantry officer dress visor hat, dated 1960. Nicely marked by the Red Warrior Factory in Moscow. Features a two- piece hat badge, the version used only from 1964-68. Size 60 (US 7 ½ - XL). In good overall condition. $70.00 Officer dress visor hat for Motorized Infantry, dated 1986 (it also could be used by an officer in Signals, Engineers or Medical Corps.) Size 56 (US 7). A classic Soviet hat in excellent condition. $80.00 Corps of Engineers officer visor hat, circa 1960s, size 55 (US 6 7/8). $295.00 Air Force officer visor hat, early 1950s, in olive green napped wool, with sky blue band and piping. Early style square visor and M 1949 Air Force officer hat badge. Approximately Size 57. $170.00 M 1955 Air Force officer dress visor hat, 1955-58. A very attractive early model used for just three years. Size 57 hat in very good condition. $40.00 Air Force School officer cadet visor hat, dated 1983. Size 59. In excellent condition. $65.00 Air Force officer service visor hat, by a Headgear Factory in Odessa, dated 1986.In excellent condition. Extra Large size 60 (about US size 7 1/2). $245.00 KGB State Security officer service visor hat in distinctive early style, dated 1955. Size 55 (Small). A very distinctive and well-marked early hat in perfect condition. 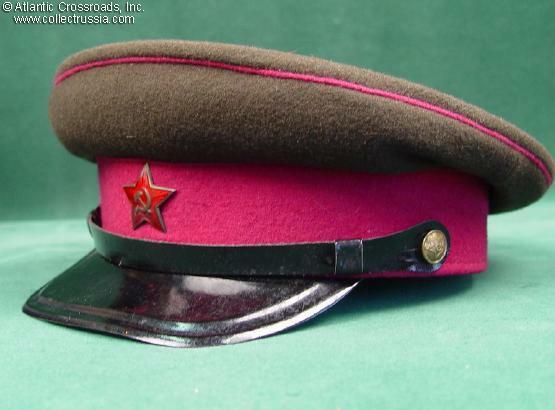 $95.00 KGB officer dress visor hat, dated 1988. Size 55. In excellent condition. $180.00 M 1947 Police NCO or EM visor cap, late-1940s - mid-1950s. Size 54 (small). A very distinctive early cap in very good condition. Includes original hat badge in brass and enamels. $60.00 Navy officer summer dress visor hat, dated 1989. Nicely marked by a Vladivostok factory. Size 55, small (US 6 5/8). In excellent condition, apparently unissued. $75.00 Visor hat of Forest Warden, 1970s - 1980s. Size 58. A very uncommon Soviet hat in good condition. $30.00 Visor hat of a Railway Transportation official, dated 1987. Blue, green, & black with winged wheel insignia. Size 57. Excellent condition. $35.00 Visor hat of Railroad Vocational School student, 1988, size 57 (US 7 1/8). $40.00 Visor hat of a Transportation College student, dated 1986.